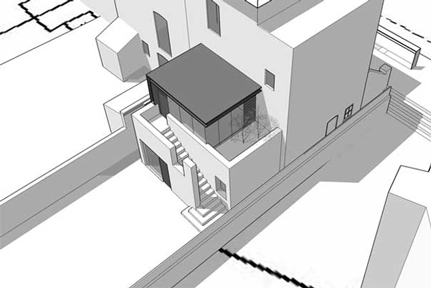 Lawrence:King successfully negotiated the planning restriction hurdles placed on this late Victorian semi-detached property situated within a North London conservation area to provide a contemporary two storey rear extension to the existing lower maisonette. The upper ground floor extension creates a new predominantly glazed bright dining room space incorporating an external stair linking directly down to the long garden. The lower ground level extension provides a new master bedroom with a new en-suite bathroom created within the existing accommodation and fully glazed doors opening onto an external patio terrace. The lower level extension also provides a new study room with garden views. The new addition is composed from a series of interlocking folded planes of London stock brick, white render, glass and zinc designed to break down the perceived mass of the extension and respectfully reflect the original materials of the existing building.